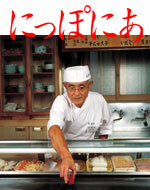 Cover photo: “Hai, maguro” (“Here you are, tuna”), says the head chef and proprietor of the sushi shop Kizushi, in the Ningyo-cho district of central Tokyo. Nipponia endorses the Visit Japan Campaign. © Heibonsha Ltd. 2008 Printed in Japan. All rights reserved. Note: Nipponia follows the custom of placing Japanese family names before given names.